Summer shoes were put on today. Tomorrow begins the interior cleaning followed by cat cleaning. Time to smell like strawberries, kitties! Strawberries, oh they're gonna love that. May the force be with you! Interior detail today! Went awesome. Then I hid the usb extension from the console box to under the radio by removing the console box door hinge bracket and sliding it down beside the actual hinge. 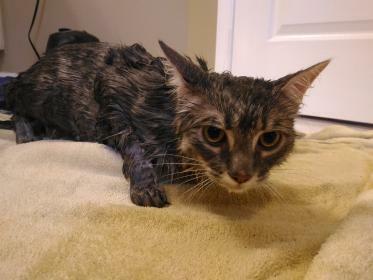 Then I changed LED drivers in two outdoor lamps, brought home a keg of Boddingtons and gave kitties their baths. Sterling is upset that I promised him strawberries but he got oatmeal and aloe. 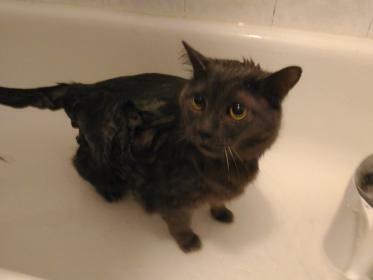 For a cat that loves water, he freaked out but he didn’t use teeth or nails once. Good boy. Thomas didn’t enjoy it but we’re cool. Last edited by Doca; 03-28-2019 at 09:09 PM. Cutlass, Seattle and AstroKats like this. Should add that even with the Husky liners, there was salt under them. The worst collection point was around the seat brackets. I cleaned them all up and sprayed some lithium grease over top. I used boiled water and manual labour to get what salt there was from around the brackets and the other places in the carpet. Also found the reminance of the wife’s spilled tea. It was under the passager seat but the boiled water easily took it out. There wasn’t much dirt, salt or gunk in the gas door lever. Surprisingly, the Huskies marked up my aluminum foot rest. I got many of the black spots off but I’ll need to use better cleaners than dash wipes to see if it’ll come off or if it’s scuffed up. I still have the huskies out as I’m giving the carpet ample time to dry before reinstalling them. The drivers was in for the beer run but I had the floor heat on high and full fan during the trip and I took the it out when I got home. Surprising that salt and yuck accumulated under the Husky. Just ran out to check mine. None found. I wonder if the Husky marred the pedals because there is rubber in the mat. Could also be cheap stuff that comes off like the soles of some shoes on tile. troutbum, Seattle and Doca like this. I wasn't going to say anything, but now that Astro bought it up, I made a phone call. Not saying who I called Doca. Not only do they not smell like litter, they’re both super fluffy. Seattle and AstroKats like this. Seattle, I'm proud of you. I should have called the EAMTs when I first learned what Doca was going to do to those poor cats. My only excuse is that I was getting on a international flight. It will forever be on my conscience. Seattle and artosa like this.